Customizing your Windows 7 OS is fun and with the right themes and tools, you can truly create a complete personalized experience on your computer. We already offer our readers with a number of Windows 7 Themes and write about other customization tools often. 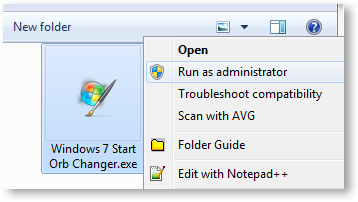 One such tool is the Windows 7 Start Orb Changer, which allows users to use custom Start buttons which will match the themes or wallpaper they are using. Lets look at some of its features and how it works. This tool is a portable app, so you do not need to install it. Simply download it and extract the contents of the zip file in the desired folder. The main interface of this app would be shown. You can click the small arrow at the right bottom to view and close the options for this software. 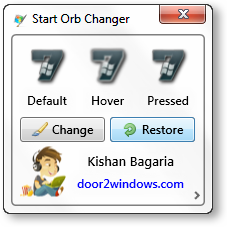 2) Click on the change button and choose the start orb image you wish to use. 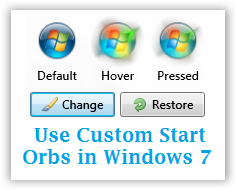 Check out our Windows 7 Start Orbs Collection that can be used with any of our Windows 7 Themes. 3) The Windows Explorer will now restart automatically and you will be able to see the new start orb/button which you chose. The Start Orb changer app will notify you if the Start button has changed. Click on the OK button. 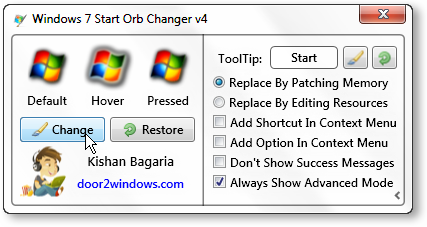 You can always click on the “Restore” button to get back the Original Windows 7 Start Orb. This app provides a few options. You can access them in the advanced view. 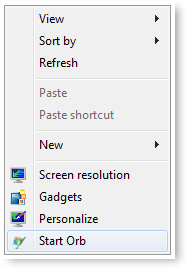 You can enable the “Shortcut in Context Menu” option to access this app anytime you want from your desktop. 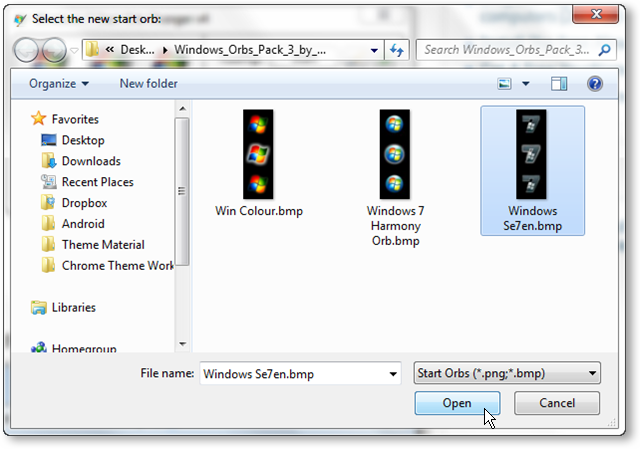 The “Option in Context Menu” on the other hand adds an option to use any .bmp or .png image as your start orb. 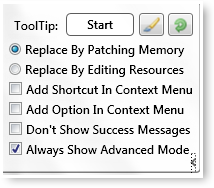 Note: If you are using SP1 or any Windows updates, check the Replace By Editing Resources option and try. Use it normally without manually tweaking any settings. Use the advanced interface to choose how the orbs are applied.